We have worked together side by side at Seymour Dental going on to 14 years. Over that time we have met many diverse patients with simple procedures, to some that need short of a miracle. The greatest joy at Seymour Dental is to see the transformation that takes place when a patient who has struggled with their teeth and don’t think they can ever achieve that lovely smile. We have seen patients who have come in so apprehensive and frightened, some with bad experiences of past dental procedures but willing to give it one more try. The staff try to reassure the patients that it is never too late, and the patient who is the worst is the “one who isn’t here”. The dentist will take their medical history before he starts any procedure to give them the best possible care as a holistic approach. If the patient hasn’t been to the dentist for many years he will suggest x-rays to see what he has to deal with under the visible eye, the bone levels are measured and also if there are any hidden wisdom teeth or anything sinister. We don’t call the dental surgeon the “Oral Sherlock Holmes” for nothing. After the dentist studies the x-ray and sees what is required he will print out a Dental Treatment Plan, with all the visits required from the most urgent to the last procedure. 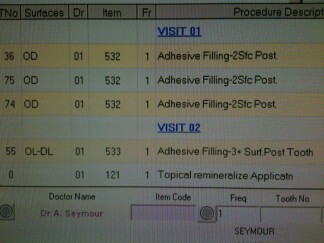 Each visit is highlighted and in bold writing so our patients can organize themselves and their budget. If there are a number of procedures required, Dr Seymour can help them by stabilizing the patient’s mouth with temporary fillings, until the patient is in a better position to carry out the procedures specified by the dentist. Some patients don’t realize there are always options and to doing nothing is often the worse thing that they can do, as the problems can only only worsen. Also having gum and teeth problems can affect a persons well being dramatically. 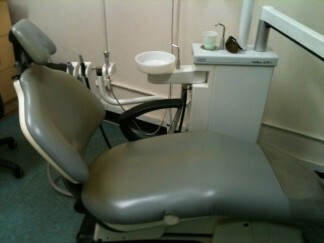 A person may not understand that by neglecting oral hygiene can lead to complicating other problems in the body. See you next week with Part 2.